The VVK Zenit-launched recoverable spaceplane design of 1998. A recoverable aeroshell encloses a small manned aircraft during launch abort or re-entry. At a safe altitude and speed, the aeroshell splits, allowing the manned aircraft to emerge and land at an airfield. The aeroshell is recovered by a parachute. The concept dates back to Cheloemei's Raketoplan designs of the 1960's. Russian manned spaceplane. Study 1998. A Russian concept of the 1990's harking back to Chelomei's Raketoplan of three decades earlier. A manned aircraft would be protected during launch and re-entry by an expendable aeroshell heat shield. Status: Study 1998. Payload: 3,000 kg (6,600 lb). Gross mass: 12,000 kg (26,000 lb). Height: 10.00 m (32.00 ft). Span: 3.90 m (12.70 ft). After re-entry, the aeroshell would separate and the aircraft would make a powered flight to a landing at a conventional airfield. The Soviet Air Force's Tsiolkovskiy MATI institute first proposed a two-module aerospace vehicle (VKK) in 1991. At that time NPO Energia examined the proposal and concluded that the concept offered too little net payload. 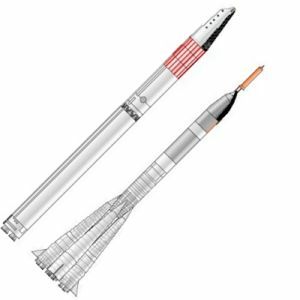 This rejection harked back to the old fight between Korolev and Chelomei in the 1960's over the Raketoplan concept. Both the VKK and Raketoplan would use a jettisonable aeroshell for re-entry from the atmosphere. However unlike the Raketoplan, the modular VKK was reusable and also provided the possibility to 'mix and match' internal payloads according to the required mission. By 1998 the MATI engineers had reformulated the design using contemporary technology. They were convinced that the concept still offered advantages absent in any other approach. The VKK was based on the principle of modularity of design. A common CM lifting-body expendable aeroshell protected the contents during ascent to orbit, launch aborts, and re-entry. Within the aeroshell, the separable PM manned aircraft lander and the internal aeroshell payload could be varied according to the mission. By use of interchangeable modules, all-cargo versions could delete the aircraft lander and deliver a large net payload to space stations or orbit. The aeroshell could then return damaged satellites or experimental results to earth. The revised design had a total mass of 12 to 13 metric tons, allowing launch by the standard Zenit-2 launch vehicle. Two to six crew were located in the winged, jet-powered PM aircraft lander. Following re-entry, once the aeroshell had slowed to subsonic speed and an altitude of 6 to 10 km, the aeroshell would split, three explosive bolts would fire, and the PM lander would separate and be flown to a landing at a conventional airfield. The aeroshell would glide to a recovery area, and make a final landing by parachute. Aside from the crew, the concept allowed two to three metric tons of payload and propellants to be taken to orbit, and 500 to 1500 kg returned to earth. The standard internal aeroshell payload included an orbital work cabin. The cabin was reached by a hatch at the aft of the PM aircraft. The cabin provided living and experimental space for the crew in orbit, and also served as an airlock. An external hatch provided access to free space. 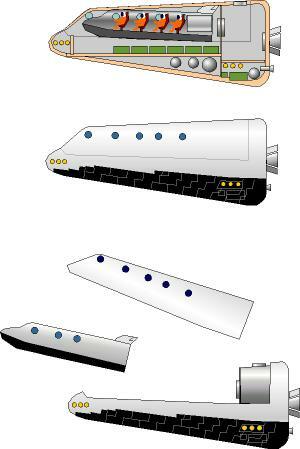 MATI felt that the mix of existing technologies (conventional subsonic aircraft, expendable aeroshell) represented a low-risk approach that would allow a flexible manned reusable ferry to be developed at minimal expense. Family: Space station orbit, Spaceplane. Country: Russia. Launch Vehicles: Zenit-2. Agency: MATI. Bibliography: 588.